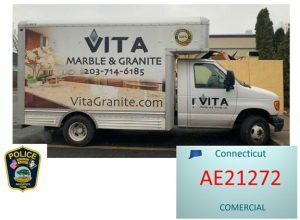 NAUGATUCK — Police are investigating the theft of a box truck from Vita Marble and Granite on Elm Street. The thief or thieves made off with more than a truck, as the truck was stocked with about $15,000 worth of tools and kitchen materials, according to police. The theft was reported on Wednesday at about 7:30 a.m. Police said the truck, a 2006 Ford model E450, was stolen sometime overnight from the business’ parking lot. 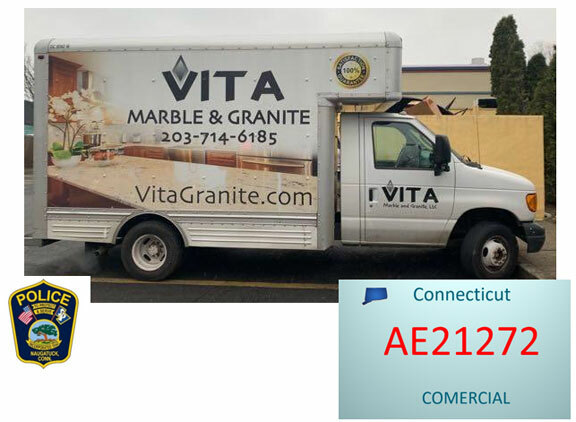 The truck is fully wrapped in Vita logos and is the only truck the company owns that is detailed, police said. The truck’s license plate number is AE21272, police said. Business representatives reported the truck was locked and they still have the only set of keys, police said. Police asked anyone with information regarding this theft to contact the Naugatuck Police Department at 203-729-5221 or the department’s confidential tip line at 203-720-1010.